In 1982, I graduated from the Department of Art as Applied to Medicine (now The Division of Biomedical Communications). My first job was to travel to Beersheva, Israel, to work for one and a half years illustrating the worlds first and only atlas of anatomy of the camel (the story of <how> I got the commission is a long one in itself... buy me a drink and I'll tell you all about it...). The project was organized by the Director of the Veterinary Hospital and Isan Center for Comparative Medicine at Ben Gurion University of the Negev, Professor Daniel Cohen. He recruited two anatomists from the Anatomy Department of the School of Veterinary Science, University of Pretoria, South Africa... the remarkable Dr. Malie Smuts and her colleague, Dr. Braam Bezuidenhout. It was my pleasure to work with Malie for the first year, and with Braam for the remaining six months. Braam looks a gift camel in the mouth. My work began with Malie in August of '82, and the procurement of specimens to study. 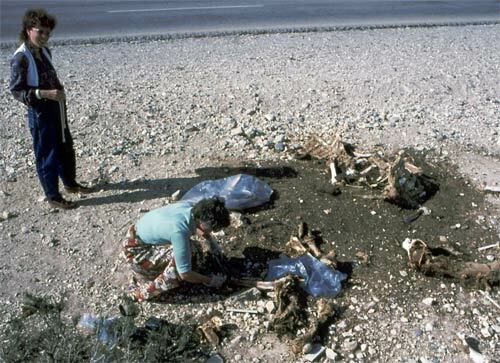 Our first skeletal material came from 'road kill' and other smelly bits found in the desert around the northern Negev desert, which we had to boil and scrape clean. Malie takes apart some camel jerky while hospital administrator and chauffeur Sara Sheik looks on. We were assisted by Shmulik Cohen and Ezat Abu-Rabiya in this important (if unpalatable) part of the project. The dessicated remains were placed in open top oil drums with water and caustic soda, then boiled oner an open fire and left to cool overnight. The next morning, the barrels of 'camel soup' were overturned, and the bones were removed from the greasy slop. After careful cleaning and scraping and a few hours under the hot sun, the bones were ready for study. Unfortunately, neither skeleton was complete as they had suffered the depredations of desert scavengers, and it wasn't until months later that we had an opportunity to clean an entire entact camel carcass and obtain a complete skeleton (and boy, was that fun!). Just as the hospital staff were wondering why a young man from Canada and a doctor from South Africa had to be brought to Israel (at great expense, no doubt) just to clean stinky camel bones, we finally began the task of writing and illustrating. 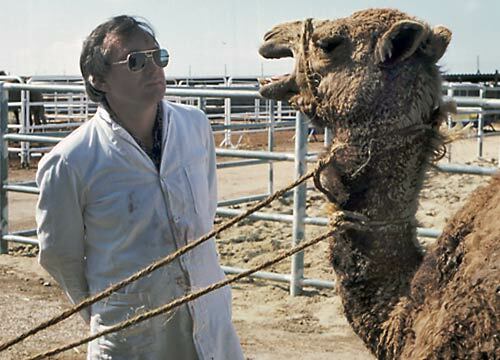 While Malie and I working on our descriptions of the skeleton, the research centre staff procured a juvenile camel from the local Bedouin for us to put to sleep in order to embalm it and dissect the musculature. We were able to use the hospital's as-yet unused large animal surgical theatre as a dissection hall and a storage area for the large tubs of formalin which contained the specimens.